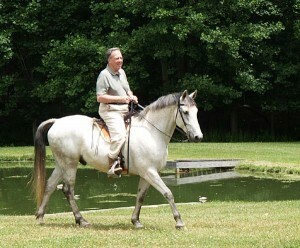 Nearaway Farm, tucked away in Millstone Township, NJ is a 27 acre facility that adjoins over 90 acres of County Park trails & tracks designed specifically for horses & walkers. Our facilities include a 17 stall main barn and a six stall broodmare barn with large, well ventilated, matted stalls. We also have a 60 foot, 8 foot high round pen and an indoor arena. All of our 4 board fenced paddocks have wide lanes between them to ensure the safety of the horses. Our staff has many years of horse care experience. We are dedicated to ensure that every detail of your horse’s needs is met. We treat them like we treat our own. Bill and Ricki Neuberg have owned and operated Nearaway Farm since 1973. We have been here in Millstone Township since 1978 and have been breeding Thoroughbreds since 1975. One of our goals has always been to find new careers for our retired racehorses. Two of our best known were Tiger One, winner of the 1996 3 day Eventing Selection Trials and Sloopy, a top level international event horse. Others have become show hunters, jumpers or pleasure horses. Dawn Adams, has been working at Nearaway Farm since 2000. 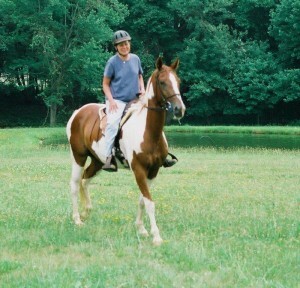 She is a lifelong horsewoman and is knowledgeable about everything here on the farm. Dawn is also a very competent rider and driver. In 2003 she won the Area II Novice Eventing Championship on our Thoroughbred “Tiger One”, and also shows her mini, “Spirit” in Pleasure Driving Classes.